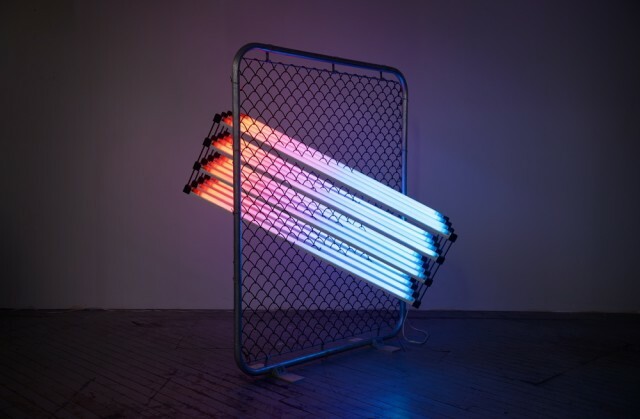 James Clar’s work looks at the influence of media and technology on perceptions of culture, nationality, and identity. He works with new technologies and production processes to investigate and critique their effects on human behaviours, whether in terms of broad socio-political trends or more personal emotions. After studying film and animation at New York University, Clar moved away from screen-based practices at graduate school, and began to work with artificial light, creating sculptural lighting pieces. By developing his own systems with which to manipulate light, he discovered he could create unique visual displays, as well as circumvent the limitations of screen-based work. In effect, these light works became a physical extension of the pixel beyond the screen, pixels that created three-dimensional sculptural form.